After Garhwa, my Highmountain Tauren Hunter, completed the Battle for Lordaeron in the World of Warcraft: Battle for Azeroth Beta, I decided to continue exploring. The next set of quests Garhwa picked up were in a brand new area that had plenty of dinosaurs. 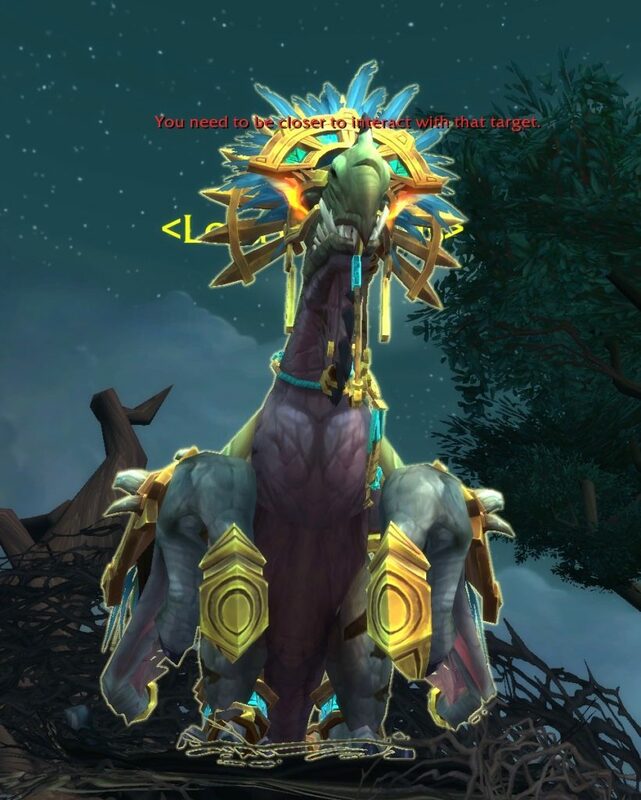 This blog includes screenshots, Twitch videos, and commentary about my experience in the Battle for Azeroth beta. There are probably some spoilers here! 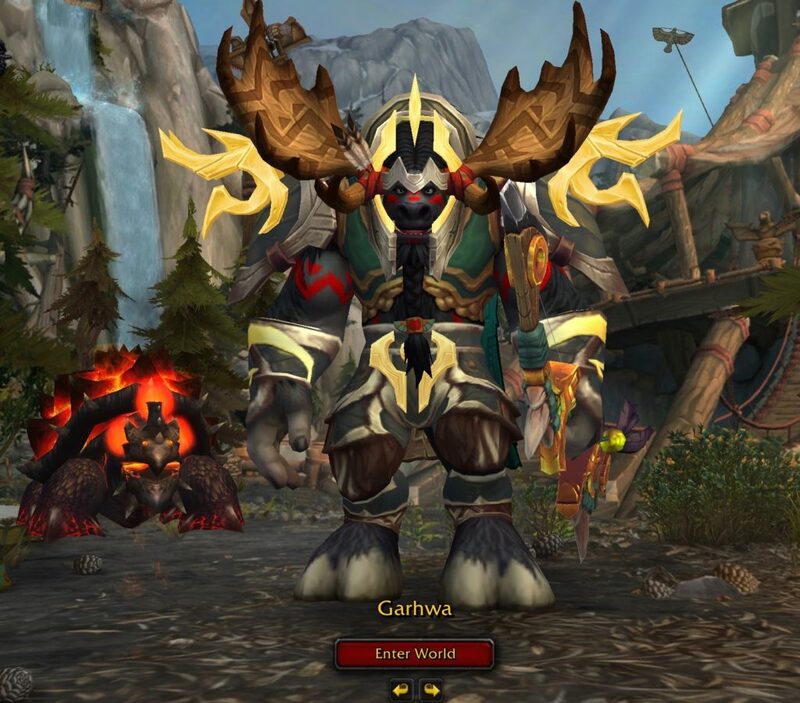 In the video above, Garhwa (my Highmountain Tauren) is working on a quest that was given to him by King Rastakhan. 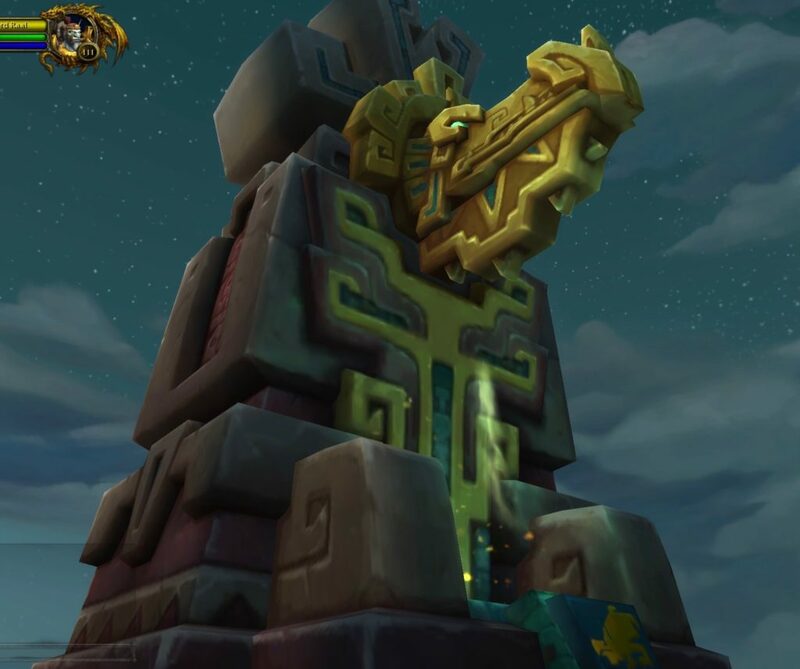 The goal is to meet Zul the Prophet in Tal’Gurub. 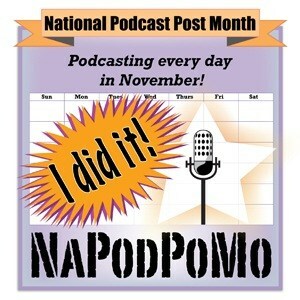 I kind of got sidetracked along the way – but eventually finished it. A person who is new to me popped into my Twitch chat and kept me company. 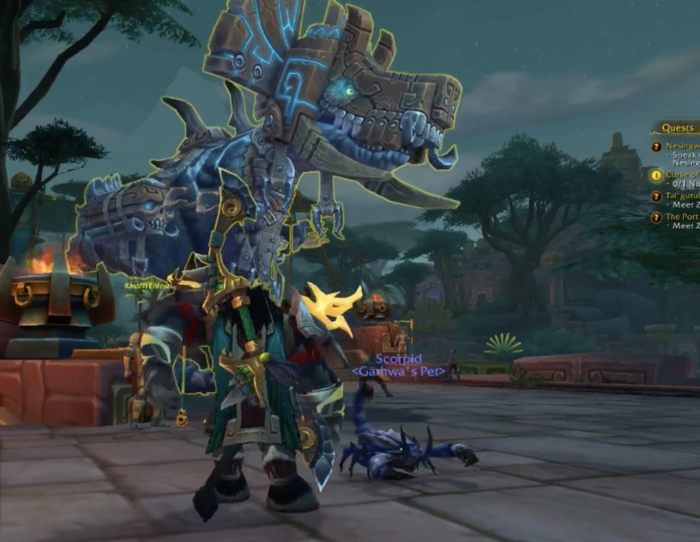 It was fun to have someone to talk about the Battle for Azeroth beta content with. The result was a more informative video than I might have ended up with if I was all by myself. There are a lot of dinosaurs in this area of the game, and some really decorative NPCs (non-player characters). I like the overall style and color palette here. 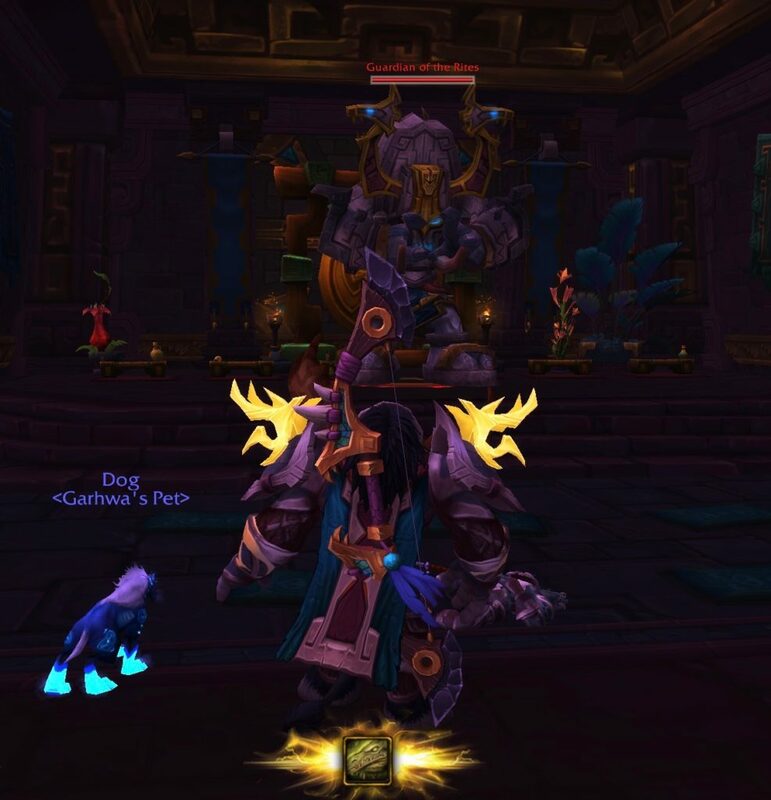 The quests I was working on emphasizes the animosity between one group (who follows one Loa) and another group (who follows a different one). Pairs of two very angry opposing religious groups stand around and yell at each other. 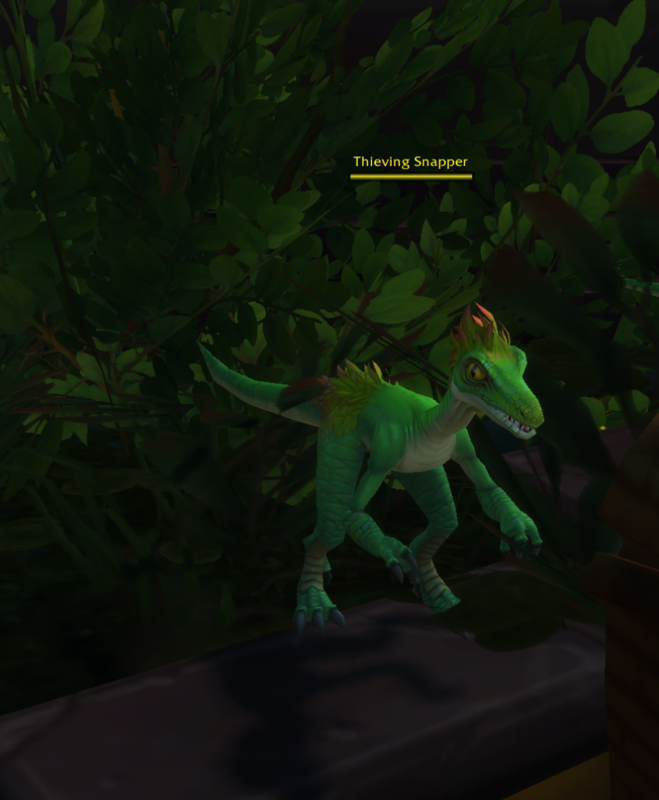 This tiny green dinosaur is a Thieving Snapper. There are plenty of them in The Zocalo. I picked up a quest that required me to kill off a certain number of them. Cute little “pests”! That quest went well, but ended with something unexpected (and possibly glitched). 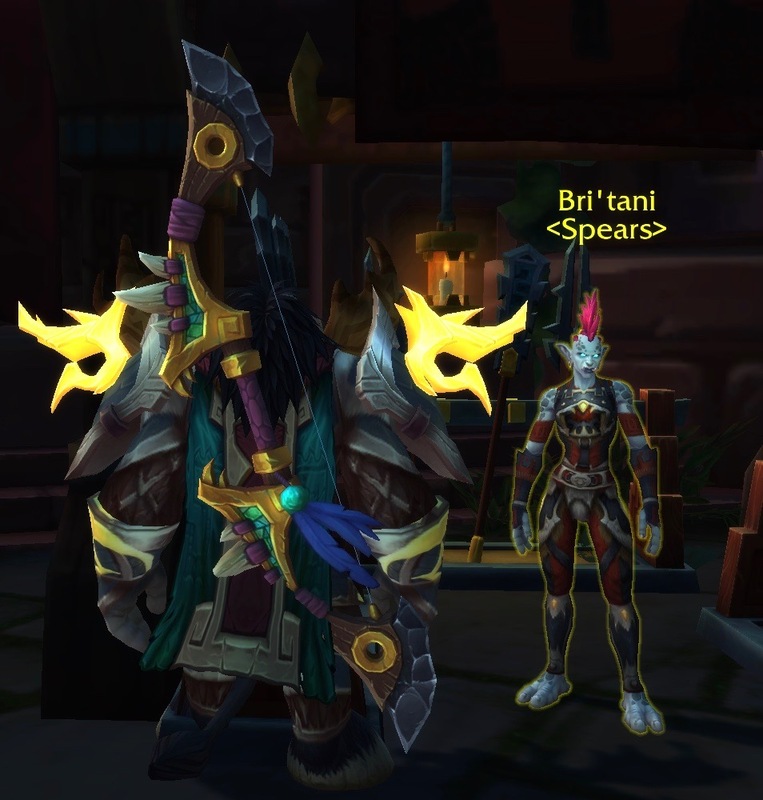 Here is a Spear vendor named Bri’ tani. Say it out loud: Bri’tani Spears. 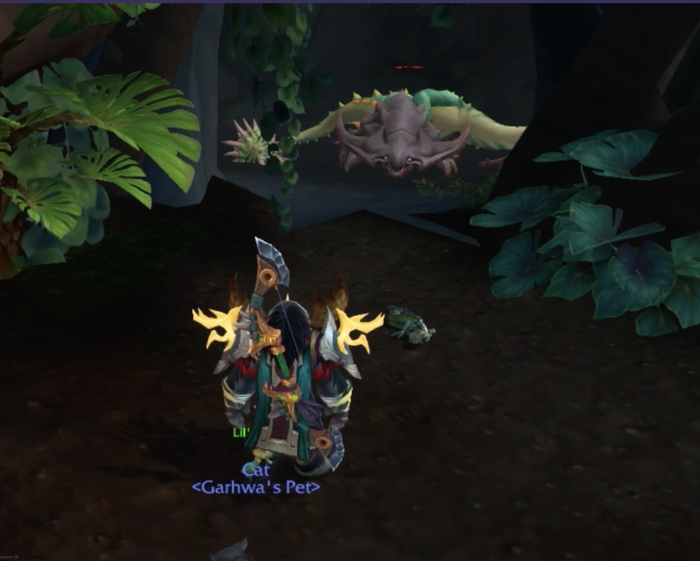 In the video above, I picked up a quest that involved throwing totems on the ground as a Pterrordax flies me (and an NPC) around an area. It took me a while to understand not only that I should be clicking a button and throwing totems, but also to throw those totems in the right place. When I watched the video, it became very clear that I was supposed to throw the totems into the little shiny areas on the road as we flew by. For whatever reason, this was not obvious to me at the time I was doing the quest. I suspect it may have been confusing because I was playing while tired. The best part about that quest is that players get an opportunity to take a look at the roads, waterfalls, flora and fauna of the area. This led to a quest where the player has to shoo away small, flying dinosaurs. Absolutely adorable! I’ll leave you to watch the video to see what happened after that. 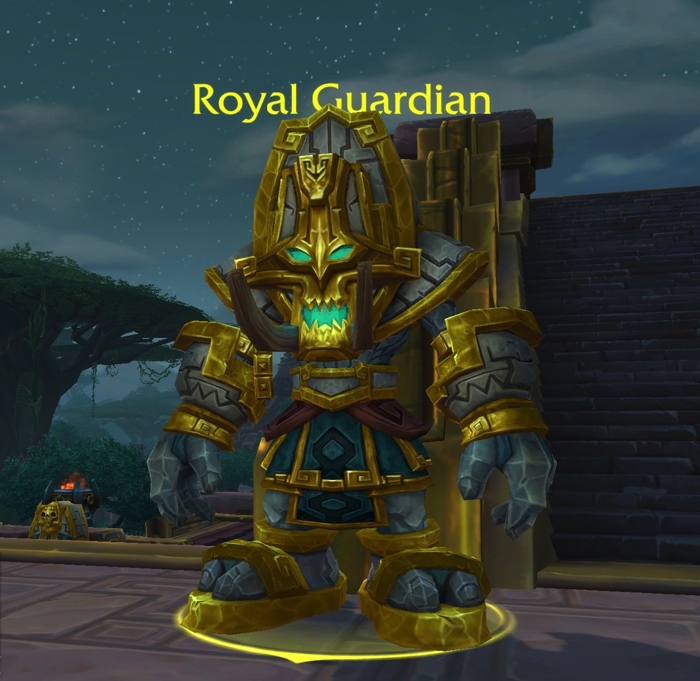 Sometime after Garhwa the Highmountain Tauren fought some Guardians, he had to make a choice. 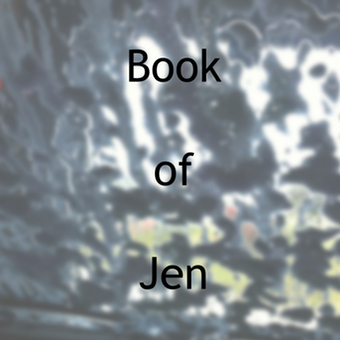 Two NPCs, of opposing religions, offered him their Loa. A player can only take one – but it looks like there is an option to change it later. Pick one – and make one NPC happy while disappointing the other one. I picked the bird. Anyone who knows me well can likely figure out why I made that choice. I earned The Zanchuli Council Achievement. I think it is for completing enough quests in the Zanchuli quest chain. This Achievement won’t carry over into the “live” game. What happens in the Beta stays in the Beta. The machine in the screenshot above is called the Scrap-O-Matic 1000. 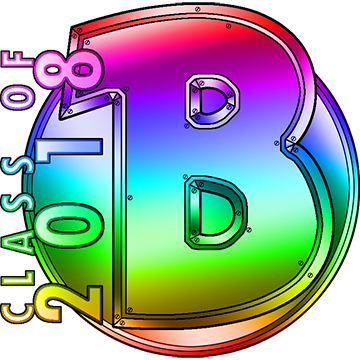 It can break down weapons or armor of good quality or higher into raw materials. 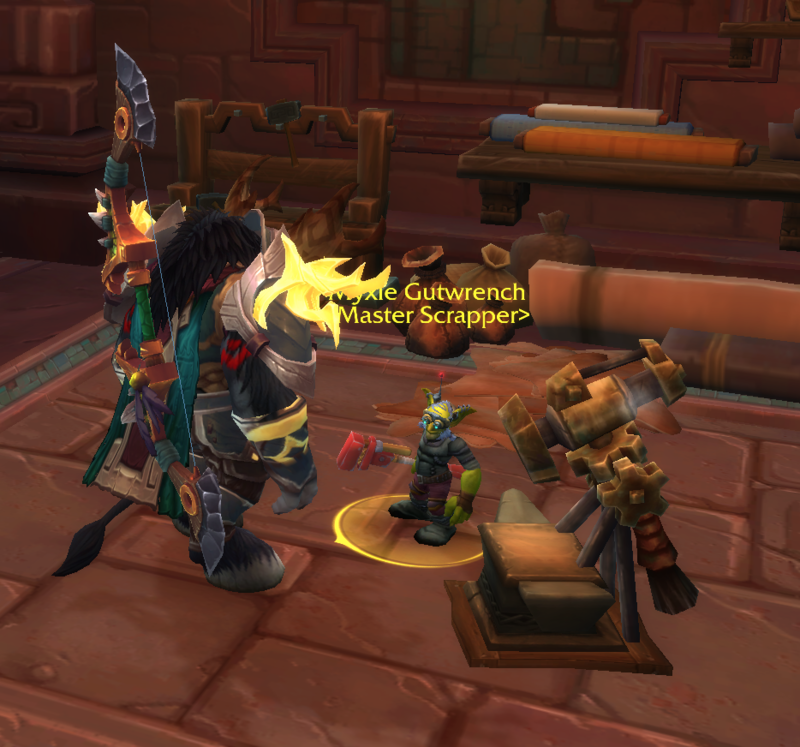 Myxle Gutwrench teaches players how to use it. He gave Garhwa a pair of tattered pants. Garhwa put the Tattered Pants into the machine, and got some scrapped cloth. It seems like it gives players back some of the materials that they used to make an item. I’m guessing that it might also break found weapons and armor into their raw materials. If so, this would give players something to do with stuff they don’t need (or can’t use) other than sell it to a vendor. 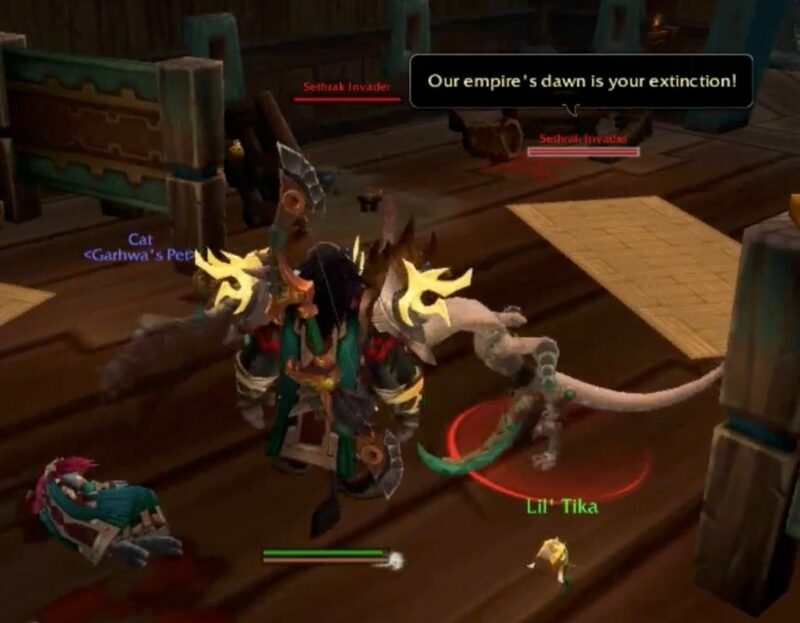 In the video above, I brought Lil Tika, an adorable dinosaur baby, to her Master – who, unfortunately, turned out to be dead. The villagers have been massacred by an invasion of snake-like humanoids. 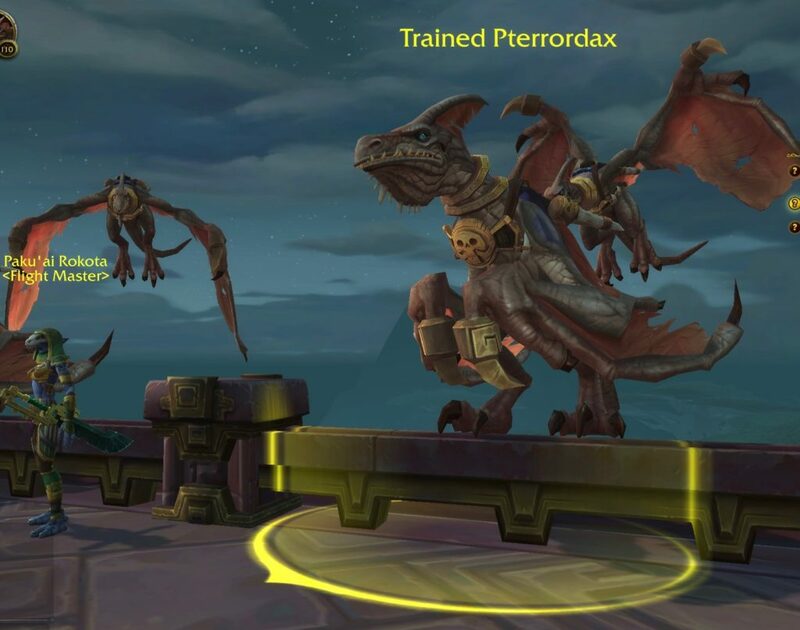 Two Sethrak Invaders appear after the player finds Lil Tika’s Master. One of the invaders says: “Our empire’s dawn is your extinction!” The phrasing makes me very uncomfortable. Maybe that was the intent of the game designers. This huge dinosaur is called Old T’Zoko. That’s all I know about this fancy dinosaur. 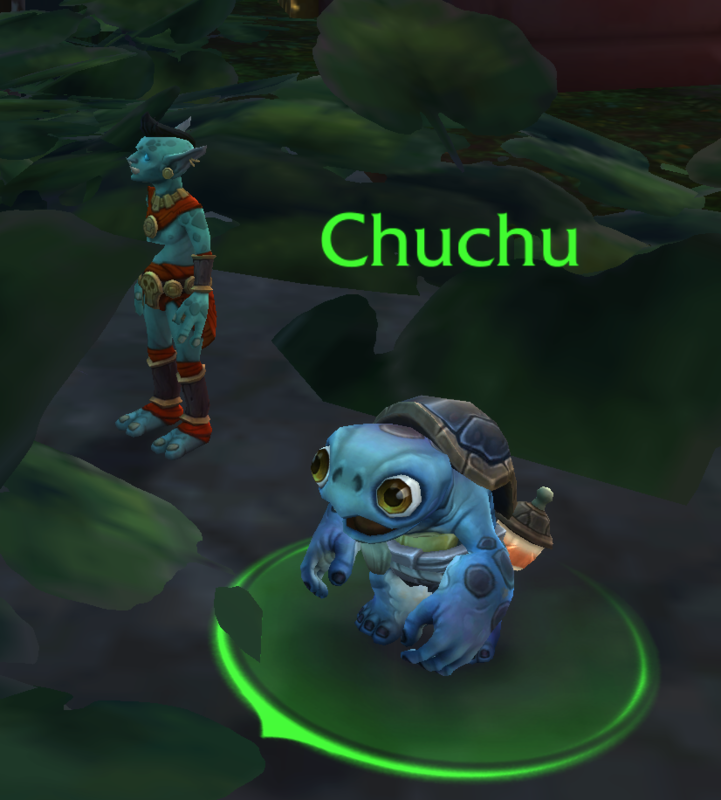 ChuChu is an adorable Tortollan child who is hanging around with a Troll child. They are considering jumping off this platform and into the water below. I think that’s not gonna end well. 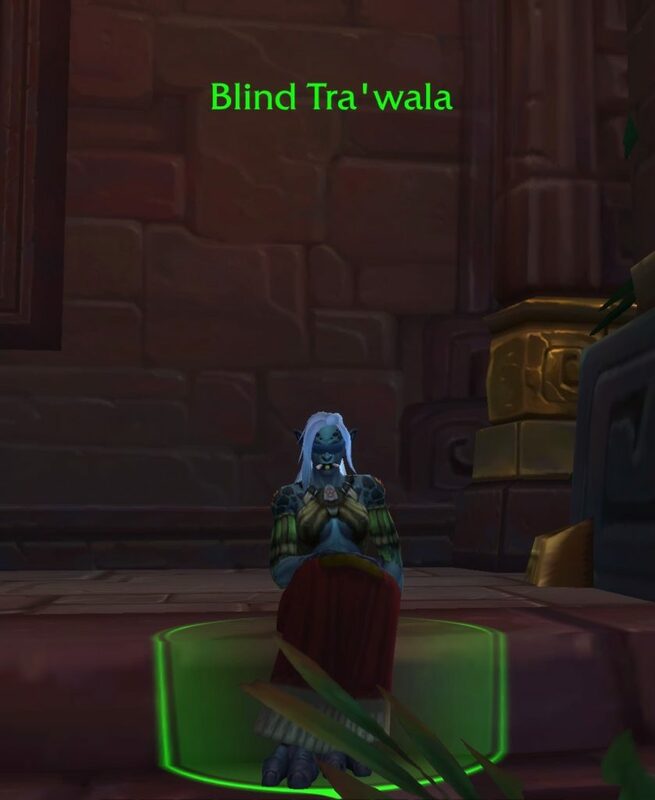 Blind Tra’wala is an NPC that says something when the player clicks on her. She doesn’t have any quests to give out (at least, not at the moment). I wonder what her story is. The Demon Hunters in World of Warcraft wear blindfolds, but she doesn’t appear to be that class. Towards the end of the video above, Garhwa the Hunter started working on a series of quests that might help two huge white dinosaurs to breed. They are the last of their kind. This series of quests appear to be a side quest. I was supposed to be working on a quest with Zul the Prophet. At this point in the Battle for Azeroth Beta I decided to take the time to switch from Horde to Alliance. My Highmountain Tauren completed the Battle for Lordaeron (and the quests that followed it) on the Horde side. I wanted to see what the Battle for Lordaeron was like on the Alliance side. If there is time, I will try and return to Garhwa and continue his adventure in the World of Warcraft: Battle for Azeroth Beta. The zone he is in, and the quests he is working through are fun and I’d like to see how things go. 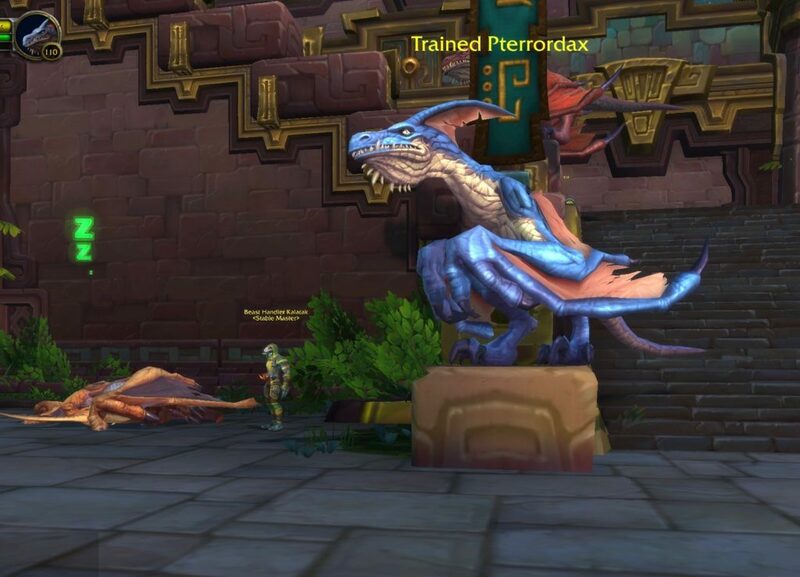 World of Warcraft: Battle for Azeroth Beta – Plenty of Dinosaurs is a post written by Jen Thorpe on Book of Jen and is not allowed to be copied to other sites.